Authored by 50 top academic, government and industry researchers, this handbook explores mature, evolving technologies for a clean, economically viable alternative to non-renewable energy. In so doing, it also discusses such broader topics as the environmental impact, education, safety and regulatory developments. 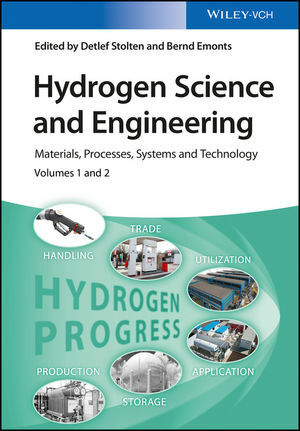 The text is all-encompassing, covering a wide range that includes hydrogen as an energy carrier, hydrogen for storage of renewable energy, and incorporating hydrogen technologies into existing technologies. Detlef Stolten is the Director of the Institute of Energy Research at the Forschungszentrum Jülich. Prof. Stolten received his doctorate from the University of Technology at Clausthal, Germany. He served many years as a Research Scientist in the laboratories of Robert Bosch and Daimler Benz/Dornier. In 1998 he accepted the position of Director of the Institute of Materials and Process Technology at the Research Center Jülich, Germany. Two years later he became Professor for Fuel Cell Technology at the University of Technology (RWTH) at Aachen. Prof. Stolten's research focuses on fuel cells, implementing results from research in innovative products, procedures and processes in collaboration with industry, contributing towards bridging the gap between science and technology. His research activities are focused on energy process engineering of SOFC and PEFC systems, i.e. electrochemistry, stack tech-nology, process and systems engineering as well as systems analysis. Prof. Stolten represents Germany in the Executive Committee of the IEA Annex Advanced Fuel Cells and is on the advisory board of the journal Fuel Cells. Dr. Bernd Emonts is the Deputy Director of the Institute of Energy Research at the Jülich Research Center, Germany. He received his diploma in structural engineering from the Aachen University of Applied Sciences, Germany, in 1981. He went on to specialize in the fundamentals of mechanical engineering at RWTH Aachen University, Germany and was awarded his PhD in 1989. Working as a scientist, Dr. Emonts has been involved in extensive research and development projects in the areas of catalytic combustion and energy systems with low-temperature fuel cells. Between 1991 and 1994, he concurrently worked as an R & D advisor for a German industrial enterprise in the drying and coating technologies sector. In addition to his scientific activities at Jülich Research Center, Germany, Dr. Emonts lectured at Aachen University of Applied Sciences from 1999 to 2008. Dr. Emonts has published extensively in the field of Hydrogen Sciences and Fuel Cells.